High above Italy’s Tyrrhenian Sea, off the north coast of Sicily, 13 students sit atop Stromboli Volcano as it erupts. Ash falls on their shoulders and ping-ping-pings their helmets. The ground beneath their feet trembles. The Island of Stromboli, Shot 2004 Sep 28 by Steven W. Dengler. The journey to Stromboli had begun the day before in Vanorio’s hometown, Pozzuoli, a colorful port city founded by the Greeks and later occupied by the Romans, at the center of a volcanic caldera, or depression, known as Campi Flegrei. Vanorio, the 13 students and two teaching associates boarded a hydrofoil in Naples and sailed south across the deep blue water of the Tyrrhenian for nearly four quiet hours before catching sight of smoke, steam and gases puffing from Stromboli’s cone. Reaching the top would prove more arduous – a five-hour climb up steep slopes of ash and rock. Sedimentologist Nora Nieminski, a postdoctoral researcher at Stanford Earth and a guest instructor on the trip, sprinted ahead to shoot drone footage that she would later help the students manipulate to create 3D models of the volcano. But the rest of the group walked without hurry. Halfway to the top, they stopped to rest near a dark scar on the volcano’s northern flank known as the Sciara del Fuoco, where the volcano has collapsed on itself. Thomas and the 12 other students on the trip visited Stromboli as part of a three-week seminar in southern Italy focused on volcanoes, archaeology and the science of Roman concrete – an exceptionally durable material that may hold insights for future materials that are more sustainable or even suitable for building habitats on Mars. 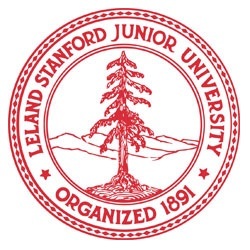 Offered through Stanford’s Bing Overseas Studies Program, the seminar is an opportunity to draw visceral connections between science and history, and to gain a better understanding of Earth along the way. Underlying the seminar’s excursions and daily lessons in geophysics, the properties of Roman concrete and 3D modeling from drone images was a larger exercise in finding connections between different fields of study. It’s no accident that students chosen to participate in the seminar represented a wide range of majors, including computer science, physics, classics, chemical engineering and political science. For Amara McCune, BS ’18, who joined a previous seminar in the region led by Vanorio in 2016, the intermingling of geophysics with dives into the region’s culture proved a powerful mix. 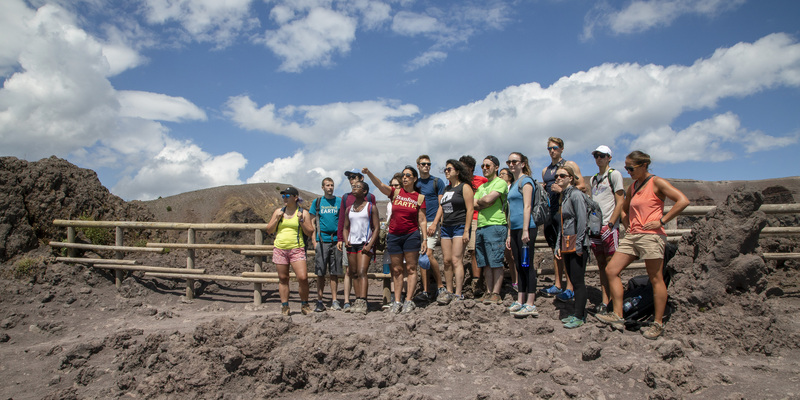 “The unique combination of learning about Pompeii, volcanic uplift and Rome while being on-site, hearing from local guides and having archaeological and geological experts point out features of a location made for an incredibly rich learning experience,” she said. Nearly all concrete today is based on a recipe developed in the early 1800s, which requires a process that’s heavily carbon-intensive. But ancient Romans invented a different recipe for concrete structures that have survived for millennia. Research now suggests this ancient material and the volcanoes that made its key components may hold clues for more sustainable building materials. Now pursuing a PhD in physics, McCune said the seminar in southern Italy helped to broaden her thinking about how she might apply her degree. “It made me more open to different fields and eager to learn the history and intricacies of the natural world around us,” she said. During the most recent trip, darkness fell as the group, giddy in anticipation of the volcano’s powerful eruptions, settled in around Stromboli’s rim. “It explodes violently and without warning – these big, loud bang explosions followed by incandescent ash flying into the air,” explained Dulcie Head, a teaching assistant on the trip and a PhD student in geophysics. By this time, the students could see the ash swirling around them as more than volcanic dirt. 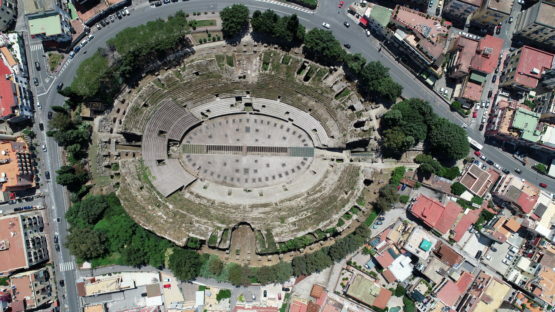 They knew that similar ash had been a key ingredient in construction of the amphitheater, harbor and ancient marketplace in Pozzuoli, and even the Pantheon in Rome, with its massive, unreinforced dome – the largest in the ancient world. 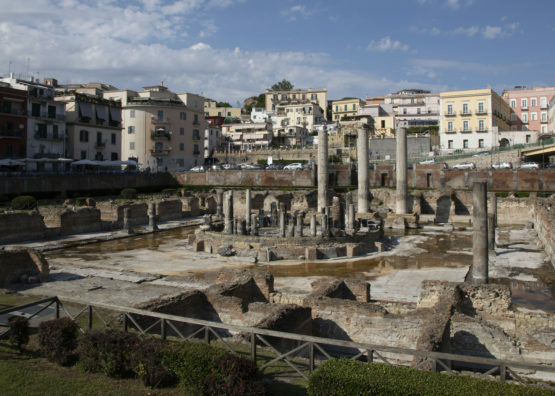 “Pozzuoli is possibly the place where Romans, by looking at nature, were inspired to make an iconic material,” Vanorio said. They developed a recipe for concrete that lasts for thousands of years using volcanic ash, lime, tiny volcanic rocks and water, while modern concrete often crumbles within 50 years. The group bounced and slid down a path on the volcano’s slopes wearing gas masks to protect their lungs from ash and sand kicked up by their feet. Back at their hotel at the foot of the island, they peeled off their masks and washed away Stromboli’s detritus. Later, the group learned how to calculate the trajectory and velocity of the volcano’s arcing ash projectiles with particle-tracking software. 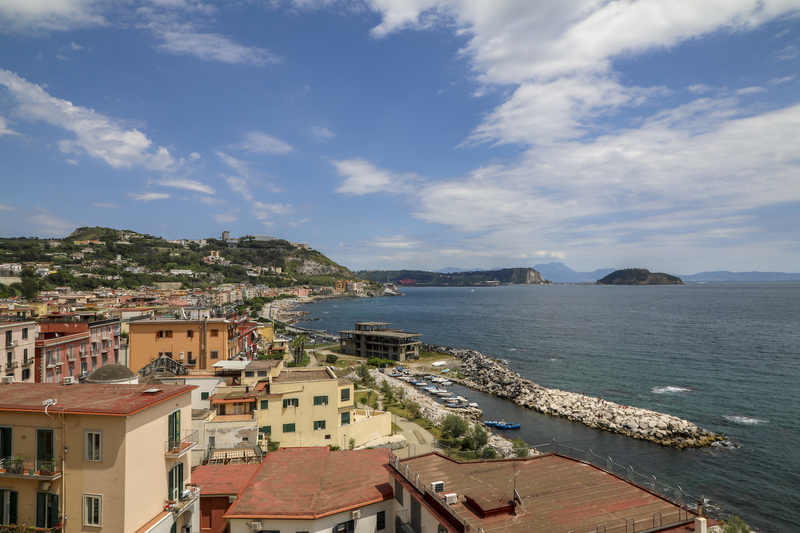 Some 150 miles across the cool Tyrrhenian, within the Campi Flegrei or “Burning Fields” caldera, lies downtown Pozzuoli. In this city best known to many Italians as the birthplace of Sophia Loren, the ruins of a Roman marketplace are a hub for cross-disciplinary connections. Pozzuoli sits on a restless, Manhattan-sized swath of coast where the rotten-egg smell of sulfur laces the air. Solfatara crater, home of Vulcan, the Roman god of fire, gurgles on the edge of town. 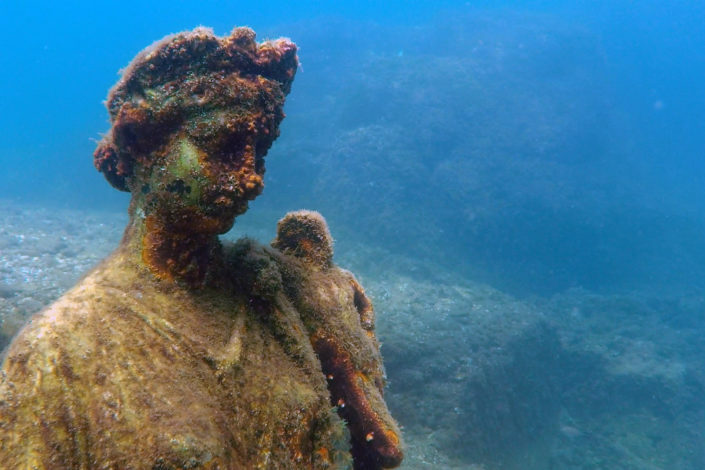 And just offshore, sculptures, thermal baths, a villa, bright tiled mosaics and other archaeological ruins rest more than 30 feet below sea level, victims of the caldera’s subsidence. Gathering close to the columns for a lecture from Vanorio while Nieminski’s drone buzzed overhead, they could see bands of tiny holes bored by so-called “stone-eater” mussels – marine mollusks that drilled up and down the columns as the rise and fall of the caldera changed how much of the structures extended above the waterline. “They literally made a mark on history,” Choo said. Using skills developed in on-campus seminars led by Nieminski, the students were able to analyze history at the Macellum and other sites with a lighter touch. They built 3D models of the marketplace from Nieminski’s drone imagery and manipulated them with software to take measurements and answer scientific questions of their own devising. Thomas, for example, examined the different materials in the columns to understand how weathering and water pressure from below played out over time. The project, she said, allowed her to weave together knowledge from chemical engineering, physics and math, as well as the geophysics lessons from the seminar. “After this seminar, I am even more convinced that many fields can overlap,” she said. Ups and downs are part of the fabric of life in Pozzuoli. In the early 1980s, the ground rose more than 6 feet in just two years, an alarming rate of uplift that reshaped the town, leaving the harbor too shallow for docking and forcing the relocation of schools and shops. 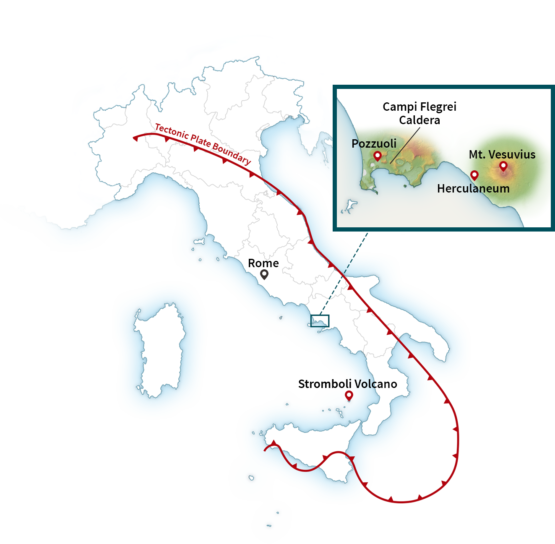 In Pozzuoli, earthquakes didn’t begin until the Campi Flegrei caldera had deformed by nearly 3 feet. “The question from a rock physics point of view has been, what kind of rocks in the subsurface are able to accommodate such large strain without immediately cracking?” The rock capping this caldera, it turns out, contains fibrous minerals mirroring those in Roman concrete that allow it to stretch and bend before failing under stress.